I am assuming you have read my bit on Angel Falls. We had spent the last several days trying to get to the falls and then we finally made it. It was really amazing and I have said this over and over, but if you can make it, go. I will always cherish this experience. I was so sunburned and dirty and we had a flight to catch back to the city. We are heading upstream in our canoe and all of a sudden the guide tells us we need to change canoes. What?? Why, we ask. Now, there is a little inappropriate cultural insensitive joke I have with my Venezuelan husband that whenever you ask a Venezuelan a question (not just him, but anyone I have ever met) they do not answer the question directly. “how is the weather?” is answered with “we need to go to the store after school”. Nothing is ever clear. And while I love my Venezuelan family, I am german heritage where questions are answered directly with as little words as possible. So – we are on the boat, the guide pulls us over. We stand on the rocky shore for a bit and then another canoe shows up. Okay.. we change and head down. Then we had someone on our tour that became ill. I am not sure she had eaten the whole time we were there or if she was dehydrated or what. BUT, she became ill about the same time we needed to… change canoes again?!? Why you ask? Who knows! I was told a story about the tide and the way the water changes. But I would swear to you that we got back into the original canoe we were in to begin with. Okay, so sick lady has rested, we are in a canoe, and we are heading back. It was about 10am and I tell our guide that our flight back is at 11am. He assures me that nothing in Venezuela is on time (I agree) and that there are only like 6 people on the plane, they know where we are, blah blah blah, sit back and it will be okay. We get back to the camp and he tells us that he needs to do something and we should take a shower. I don’t want a shower. It is now 10:50 and I want to go get on the plane. Plus the shower isn’t really a shower.. more of what you see when you go camping so I am not sure I am going to get really clean anyway. Now I am sunburned, hot, dirty, tired, and all I want to do is get to civilization. Don’t get me wrong, I loved the jungle. For a couple days. I clearly am not Jane. Tarzan would have to move to the big city to be with me. As we finally convince Juan our guide (who was super cool btw), to get us to the, um airport?, we are driving through the jungle. And then I see it. Our plane. Taxiing. Then taking off without us!! 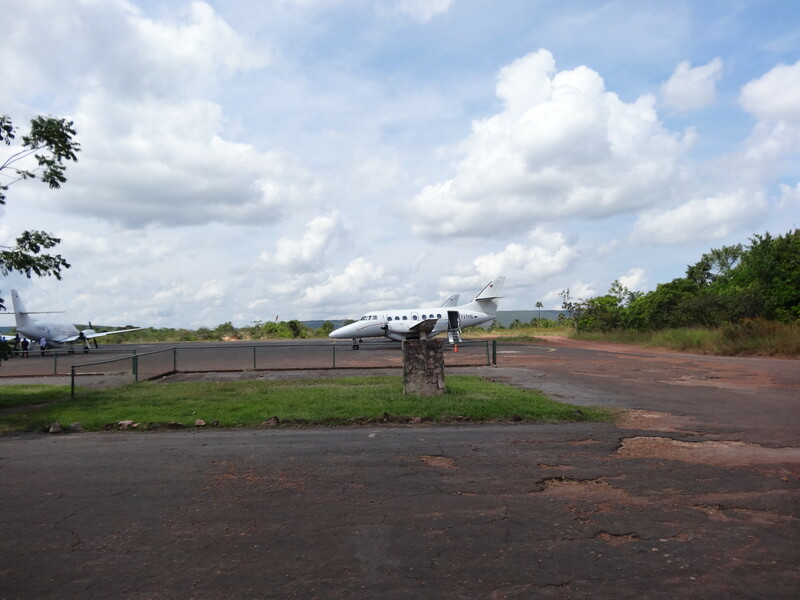 Nothing in Venezuela is ever on time except for the little plane in Canaima. We are quiet and hope that it is a different plane. Juan hops out of the truck and he starts talking to people frantically. Picture this in your mind.. it is an open field. Lots of little planes. One grassy runway. The ‘airport’ is litterally a hut. There are people selling stuff they made there. Maybe a spot for pilots to get food. But it is basically and in-and-out place. There is a guy walking around as a ‘local’ in a loin clothe. I am not sure if that was advertizing or if he was for real. So Juan is talking to people and then my husband starts in on the situation. We called the tour company and they had to call another company that said that wasn’t their fault. Apparently we were not on the flight manifest so that is why they didn’t wait for us. But then the first company blamed the next company etc etc etc. I am sitting on a bench with some pilots. The frantic talking starts to be yelling. They suggest we spend another night in the jungle. We have connecting flights and need to get out to the city. Finally after what felt like all day, I had enough. I announce that I am calling the US embassy to find me a way out of there. Now, I know. they could care less. But I was scared and wanted to motivate them to get me out of there now. Well, as crazy as that sounds, it worked. One of the pilots overheard me and said “oh miss, there is no need for that. I need to go to the city anyway so I will take you”. Didn’t my mom teach me not to take rides from strangers??? What do we do? and then my husband reminds me – Kidnapping Americans would require great organization. There is no way this was not safe to do. We approach the very very nice gentleman’s plane. It’s a Cessna. No problem. Andres hops in the back and me in the front. I am all freaked out. Then we start to go. Now, I can sleep anywhere that has an engine. So, all that fear – gone. Best nap of my life. Really. The flight we needed to take was in Puerto Ordaz, but the pilot could only take us to Ciudad Bolivar, about 100 kilometers away. Apparently the tour company arranged to have a guy (a boy really) take us from one airport to another. The pilot tells us we have several hours and we should take the time to explore Ciudad Bolivar. I really don’t want to. I really just want to get to the city, freshen up and relax. The pilot goes on and on about the museum and we must see the museum. Reminder: I haven’t showered in days, I am sunburned, all my personal items are in a makeshift purse of a gallon ziplock bag to prevent them from getting wet in the canoe, so, going to a museum is not on my agenda. We get off the plane, we thank him for saving our lives and I run into the bathroom to take a shower in the sink. I come out and the hubs is talking to a kid, maybe 15, probably 13. This is our driver. He is very proud of Cuidad Bolivar. He says we have plenty of time and if he just takes us to the airport there is nothing to do and we will be bored. He also says we must see the museum. Now we are curious. We get in his older but very well kept compact car and head out. He takes us on a tour of the city and we stop at his favorite arepa cart/table/stand. Excellent arepas. I am still holding my ziplock bag purse. We eat our food and get back in the car. The kid insists that we must see the museum (is he getting commissions). We agree and head over to the museum. We walk in and the front desk guy tells me I must check my purse. It is a ziplock bag. I tell him “no” and he says, “okay” (note to self: rules are usually just guidelines). Then we understand what the commotion about the museum was. This was not an ordinary museum. We are in a very small city in the middle of Venezuela. There are only about 300,000 people that live there and the main jobs are farming. We are not in NYC or Paris. I was not expecting this. The museum was the Jesús Soto Museum of Modern Art. Here I am sunburned, stinking with my gallon ziplock bag. And I am so tired I want to lay on the floor and we apart of his exhibits. I tried to be a sport and really look at his work. Since then I have seen his creations in other museums and I terribly regret how tired I was. Then I turned the corner.. there it was. Moonwalk, Andy Warhol. Really? In the middle of Venezuela. I have more respect than ever now for this fabulous culture. And I am glad I listened to the pilot and the kid. Well, hubs listened to them. I barely went along with the deal. 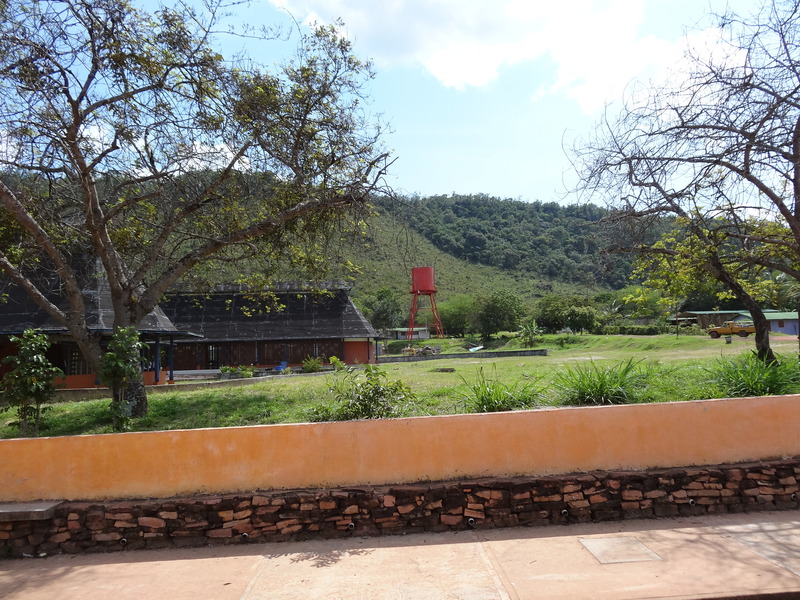 Once we were done, we get in the car and head the 100 kilometers to the next airport. The drive was fantastic but the kid was going so fast, that there was not enough time to take it all in (or get concerned about kidnapping, but that is another story). We made it out of the the airport and back to Caracas. My family greeted me with a surprise birthday cake (it was my birthday trip). And then I took a shower and went to bed. A view from the plane as we flew from Canaima to Ciudad Bolivar. What a story. Obviously not for the faint of heart.